Nasze dziedzictwo : kultura powiatu bialskiego. - Biała Podlaska : 3J-Studio Grafiki i Ilustracji, 2015. - 98 s. : il. (gł. kolor.) ; 30 cm. 1 placówka posiada w zbiorach tę pozycję. Rozwiń informację by zobaczyć szczegóły. Cellular and molecular immunology / Abul K. Abbas, Andrew H. Lichtman, Shiv Pillai. - 6th ed. - Philadelphia : Saunders Elsevier, cop. 2007. - VIII, 566 s. : il. kolor. ; 28 cm. Cellular and Molecular Immunology takes a comprehensive yet straightforward approach to the latest developments in this active and fast-changing field. Drs. Abul K. Abbas, Andrew H. Lichtman, and Shiv Pillai present sweeping updates in this new edition to cover antigen receptors and signal transduction in immune cells, mucosal and skin immunity, cytokines, leukocyte-endothelial interaction, and more. In print and online with additional resources, this reference is the up-to-date and readable textbook you need to master the complex subject of immunology. Scimitar / John Abbott. - New York : Island Books, cop. 1992. - 389 s. ; 18 cm. Two women are murdered in New York, both with British passports, both with small green scimitars tattooed below their breasts. A killer of cunning and ruthlessness is on the loose. In this thriller, the target is the American president and the method is ingenious, unexpected and totally possible. Blueprint One : student's book / Brian Abbs, Ingrid Freebairn. - Wyd. 18. - Harlow : Longman, 1996. - 141 s. : fot., rys. ; 27 cm. ‘Building block’ approach, with solid, structural syllabus. Practice exercises in the Students’ Book with optional extra material in the Activity Book. Picture dictionary and illustrated grammar reference in the Students’ Books help reinforce language. Step-by-step lesson plans, photocopiable tests, and simple craft activities in the Teacher’s Books. Blueprint One : workbook / Brian Abbs, Ingrid Freebairn. - Wyd. 17. - Harlow : Longman, 1995. - 75,  s. : rys. ; 26 cm. Provides a range of optional additional exercises and activities to reinforce learning of the target language. Primarily intended for classroom use, but may also be used for homework assignments. Language reference sections with additional exercises relating to the presentation of language structures. Flying Start 1 : książka ucznia / Brian Abbs, Ingrid Freebairn, Luciano Mariani. - Harlow : Longman, . - 77 s. : il. ; 28 cm. Flying Start 2 : książka ucznia / Brian Abbs, Ingrid Freebairn, Luciano Mariani. - Harlow : Longman, . - 80 s : il. ; 28 cm. New Discoveries 1 : student's book / Brian Abbs, Ingrid Freebairn, Luciano Mariani. - Harlow : Pearson Education, . - 77 s. : il. ; 28 cm. New Discoveries is an adaptation of the Discoveries series: the orginal material of the three part course is divided into four stages. The Grammar Practice is now incorporated into the Students book and tests are included in the Teacher s Book. New Discoveries allows appropriate progression and arrangement of material for a four year language course (classes 5-8 ). New Discoveries 3 : student's book / Brian Abbs, Ingrid Freebairn, Luciano Mariani. - Harlow : Longman, . - 95 s. : il. ; 28 cm. New Discoveries 4 : student's book / Brian Abbs, Ingrid Freebairn, Alice Lester. - Harlow : Longman, . - 96 s. : il. ; 28 cm. New snapshot elementary : student`s book / Brian Abbs, Ingrid Freebairn, Chris Barker. - Harlow : Pearson Education, . - 135 s. : il. kolor. ; 30 cm. With New Snapshot you can: * Capture Students' interest and imagination though real characters and language, and up-to-the-minute teenage topics. * Bring language to life. * Widen students' experience of international culture through new culture pages, new projects and a new teenage lifestyles video. * Provide extra support with the unique Language Booster - a Workbook and Grammar builder in one, now with Boost Your Writing sections to improve students' performance in the skill area. * Solve the problem of mixed ability classes with exercises at three levels of difficulty in the Language Booster. New snapshot starter : student`s book / Brian Abbs, Ingrid Freebairn, Chris Barker. - Harlow : Pearson Education, . - 136 s. : il. kolor. ; 30 cm. 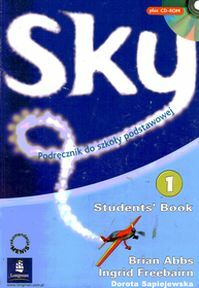 Sky 1 : student's book : podręcznik do szkoły podstawowej / Brian Abbs, Ingrid Freebairn, Dorota Sapiejewska. - Harlow : Longman, 2005. - 119,  s. : rys. ; 30 cm + Audio CD. Do każdego egz. dołączona jest płyta CD o takiej samej sygnaturze jak książka. Sky to nowy, czteroczesciowy kurs jezyka angielskiego dla uczniów klas 4 - 6 szkoly podstawowej, opracowany przez Briana Abbsa i Ingrid Freebairn, autorów wielu swiatowych bestsellerów. Ten kurs ozywi kazda lekcje dzieki autentycznym bohaterom, z którymi dzieci od razu beda sie utozsamiac, oraz zdjeciom ukazujacym sytuacje wziete z zycia. Codzienny jezyk Sky oraz bogactwo komponentów kursu stanowia wyjatkowa zachete do nauki na lekcjach i w domu. Snapshot compact : student`s book and workbook / Brian Abbs, Chris Barker, Ingrid Freebairn. - Harlow : Pearson Education, . - 159 s. : il. ; 30 cm. "Snapshot Compact" jest adaptacją popularnego kursu Snapshot przeznaczoną dla klas o mniejszej ilości godzin języka angielskiego i większej liczbie uczniów w grupie. Trzy pierwsze poziomy kursu Snapshot zostały przekształcone i podzielone na cztery części. Selekcję materiału i nowa strukturę podręcznika szeroko konsultowaliśmy z polskimi nauczycielami. 100 Briefe Deutsch für Export und Import / Birgit Abegg. - Wyd. 5. - Berlin : Langenscheidt, . - 160 s. ; 22 cm. Publikacja dla osób, które chcą, w sposób profesjonalny, prowadzić korespondencję biznesową w języku niemieckim. Pozycja zawiera wzory listów w języku niemieckim oraz praktyczne wskazówki na temat formy pisma biznesowego, urzędowego, faksu i e-maila. 100 listów - język niemiecki : biznes, handel, administracja / Birgit Abegg ; tł. Zofia Kotowska. - Berlin : Langenscheidt, cop. 2002. - 160 s. ; 21 cm. Social change in contemporary Britain / Nicholas Abercrombie, Alan Warde. - Ed.1, reprint. - Cambridge : Polity Press, 1995. - XI, 189 s. : il. ; 23 cm. This book is a lively and up-to-date account of the major developments in British society over the last 25 years. It is an excellent teaching text and an ideal companion volume to the highly successful textbook Contemporary British Society. Consisting of nine essays by leading sociologists, Social Change in Contemporary Britain examines some of the most important changes which have occurred during the lifetime of most students today. Areas which are discussed include: the decline of manufacturing industry; changes in higher education and the effects these have had on womens' employment opportunities; the development of pop music over the past 25 years. The volume also includes chapters on the changing sexual division of labour; Thatcherism and post-Fordism; changes in household structure and dynamics; new religious movements, and crime and policing from the 1960s to the 1980s. Ta pozycja znajduje się w zbiorach 2 placówek. Rozwiń listę by zobaczyć szczegóły.